The Outside Magazine article is a good place to start if you’re unfamiliar with this story. Given his lifestyle, I imagine Garret probably appreciated this article more than any of the others. I didn’t know what to make of the Lisi story at first, but I’m glad it’s resurfacing, it’s a bit of light relief in our dull lives. ..
2. I don’t see the problem with the surfer angle – surely it makes a welcome change from the usual media view of scientists. Besides, if Lisi is not a full-time academic, it simply means he probably has more time to think than the rest of us, not having to deal with endless admin, emails, proposals, teaching etc! 3. I’m delighted to see group theory get some attention – few outside the field have the slightest idea of the importance of group theory in particle physics. It seems some experts think that the whole E8xE8 thing may turns out to be a fairly trivial classification, but I enjoyed Lisi’s paper no end. It’s interesting that Dad’s book on group theory (chap 10) makes it clear that the E8 group had long been of interest to the supersymmetry gang, for reasons I don’t begin to understand. Technical stuff aside, the whole story is reminiscent of Gellmann’s eigthfold way, no bad thing. All in all, I think scientists are inclined to react strongly against media attention, especially if we feel there are more deserving cases. We need to get over this, because such stories probably do far more for the public perception of physics than any number of well-intentioned school visits! I probably should have explained what a Theory of Everything (TOE) is – it’s a theory that incorporates a description of the elementary particles and all their interactions (as opposed to a Grand Unified Theory, which is a theory that unifies three of the fundamental forces). If gravity is included in a unified framework like this, it’s called a Theory of Everything, because that’s all the forces we know. Unfortunately, it has proven very difficult to incorporate gravity with the other three interactions, not least because we don’t have a quantum theory of gravity (all the others are quantum theories). In short, Einstein’s famous quest for a unified field theory now continues under the title ToE, and is still the Holy Grail of theoretical physics. In short, Einstein’s famous quest for a unified field theory now continues under the title ToE, and is still the Holy Grail of theoretical physics. 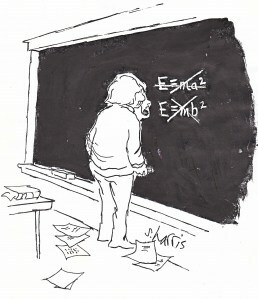 is that because we are now looking for something as elegant as E=MC2? why is it so important to link all the forces together in one equation? maybe it’s like oil and water and the 2 can’t mix but perhaps just interact in complex ways. Is this something that CERN will look into with that new collider coming on-line? Lisi’s attempt toward a simple TOE was intriguingly close but it failed (see Jacques Distler’s blog entry, where he proved that 248 irrep of E_8 contains non-chiral fermions when decomposed with respect to Spin(3,1)x SU(3)x SU(2) x U(1) subgroup). Still the Lisi attempt was not in vain, because it gives a non-trivial insight in the nature of the problem of group theoretical unification of gravity and Standard Model. Now, whether all the forces in the Universe are unified or not, can not be answered from the current experimental evidence. However, there is a strong urge among theoretical physicist to search for the unification schemes, and my personal opinion is that our brains somehow now more than what the experiment present us. Hoosier: I should have said, unification is not just an abstract wish. Using the methods of gauge symmetry, theoreticians in the 1970s established a strong, unexpected connection between two of the fundamental forces, the electromagnetic and the weak nuclear force. The theory predicted the existence of as-yet unkown particles (W and Z bosons), which were then spectacularly discovered in high-energy experiments at CERN in the 1980s…ever since we talk about the electro-weak interaction as a single entity..
All of which leads to leading to the simple picture of a single super-force at the tremendous energies of the Big Bang, which gradually splits off into the four seperate entities we see today as the universe cooled…pretty cool eh? Aleksander – yeah, I thought Distler gave a very good discussion of the subject (as far as I could understand, that is). I think you’re right overall too, the Lisi attempt brought quite a bit of clarity to an area that is very muddled for some of us! When I said that there was no current experimental evidence that all forces of Nature are unified, I was thinking of unification of gravity with the Standard Model forces. However, the idea of unification is very natural and compelling, and the best candidate up to date is the string theory. As far as Lochlainn’s positions on string theory are concerned, the best sources should be the writtings of his colleagues, or to directly ask those who are still alive.